According to the National Weather Service, scattered to numerous thunderstorms are expected late this afternoon and evening. The greatest threat will be across south central and southeast Kansas, where hail up to golf-ball size and damaging winds to 65 mph will be possible. 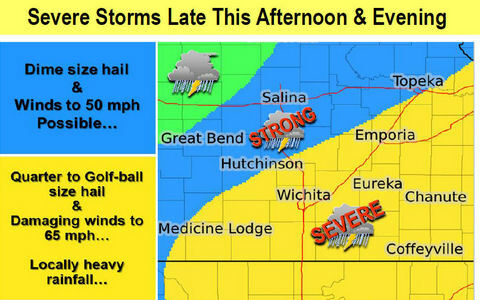 The main severe risks are still expected to be large hail up to golf ball size across south central and southeast Kansas with locally damaging wind gusts to 65 mph also possible. Locally heavy rainfall may also result in minor lowland or urban flooding this evening.